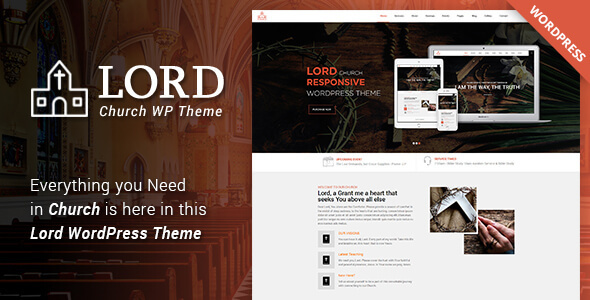 Lord â€“ Responsive WordPress Theme is designed for churches, religious organizations, charity services and similar sites that require a responsive and creative design. With Lord WordPress Theme, you will be able to find multiple creative options to showcase what you are offering. You can display service times and upcoming events. You can publish your sermons and the website allows you to update the team section as well. Lord WordPress theme also has Woocommerce and Event Manager setup that will help you manage your shop and events respectively. With this theme, you will have to 2 About pages, and a page for Pastors. With Lord, you can have multiple pages for Gallery, Sermons. The theme is highly responsive whcih makes it compatible with all modern mobile devices. It is niche specific design with a dynamic functionality that helps you capture the audience.